In Marin, a wildfire on September 17 burned from Ignacio through Lucas and Nicasio Valleys, to Woodacre, Lagunitas, and Bolinas Ridge. This happened at the same time as huge fires burned in Sonoma County and in Berkeley, along with 15 other counties in California. "As to why these fires, in the forest and in the city, raged so fiercely for a period and subsided so quickly, almost simultaneously, the daily weather maps and the records from the California stations of the Weather Bureau give some very pertinent information. They show the inception, duration, and breaking up of a typical 'fire-weather' condition." ​ Read the full weather report for that time below the story, shared from the American Meteorological Society website. Thousands of homes were endangered and many were destroyed, and large areas of timber and grazing land burned over by one of the largest fires that ever took place in this county, that started at Ignacio last Sunday and swept southerly and is now burning in the vicinity of Lagunitas; estimated damage was easily a quarter of a million dollars. At the same time fires were burning in eighteen counties throughout the state. The fire started Sunday from smouldering embers fanned by a heavy gale, which spread rapidly and was soon beyond control of the fighters. The embers were left from the fire that was put out after a hard fight, Wednesday, Sept. 12th. The heavy gale whipped it into huge flames that swept down towards Lucas Valley and endangered the county farm. Here, fire fighters congregated and after a long and arduous struggle diverted the fire through the Lucas Valley and saved the [County] farm. The fire then went through the valley to Woodacre, burning the Hill, Bulltail, Lucchini and Dias ranches. At Woodacre, only five houses out of thirty-five were left standing. All day Monday the fire raged from Woodacre dowm to the rear of the Sleepy Hollow ranch. Citizens of the county, students of the Tamalpais Union High School and the San Rafael High School and detachments of soldiers from the Presidio and Fort McDowell were called in to save Fairfax. When the fire reached White’s hill thirty girl patients of the Arequipa Sanitarium were rushed to the Fairfax Community House where they spent Monday night. Monday night the fire was in the Cascades, about a mile and a half from Fairfax, but after hours of hard fighting and backfiring it was halted in the Cascades. It then started going over the Fairfax ridge and the Bolinas ridge burning everything in its way. Wednesday morning the fire was considered to be under control and the soldiers from Ft. McDowell were sent back. The fire in Lucas Valley around San Geronimo, Lagunitas and Forest Knolls was well under control Wednesday night. Monday night the San Francisco Fire Department sent four companies into Sonoma to fight the fire that destroyed the town of Boyes Springs and threatened the whole Valley of the Moon. The apparatus sent over with the four companies represented about a million dollars. At the same time, ten companies were sent to Berkeley, three of which went into Oakland to answer alarms that were not responded to by the Oakland Fire Department, most of their apparatus being in Berkeley. While fires were burning in Marin and Sonoma counties and Berkeley, San Francisco had forty-seven fires, of which eleven occurred at one time. The San Francisco firemen were working at eleven fires at one time and still had ample apparatus for the balance of San Francisco or to lend out in an emergency. Special train left here at midnight Monday to take firemen and their equipment to Sonoma. [Sausalito] Fire Chief Cook met the San Francisco firemen here and helped them to the train. The damage done to the Northwestern Pacific by the combined fires of Marin, Sonoma and Mendocino counties, amounted to approximately $25,000. At Boyes Springs the station and two trestles were burned out Monday night. The trestles were replaced by Tuesday night, allowing the trains to go through to Glen Ellen. On the Cazadero line, all trestles east of Duncan's Mills and at Markhams, two trestles were burned. One car was burned in the Austin creek gravel pit and another at Casini. It was first reported that Engine 86 was destroyed, but. Supt. McMullin states that there was practically no damage done. At Casini, near Duncan’s Mills, the Mitchell and Virden Lumber Company mill was entirely destroyed, besides the buildings and timber on a number of large ranches in that vicinity, and the bridge across Austin creek; the town of Markham was wiped out, and the Eaton Mill burned. The railroad company practically saved the town of Guerneville when 50 railroad men built a fire trail. President Palmer and Superintendent McMullin left on Wednesday on a special train to investigate the damages done the property. Conductor Heselschwerdt took the last train through the Boyes Springs fire to Glen Ellen and he and the train crew saved the home for the feeble minded. Conductor Johnson and his train, which arrived at Boyes Springs shortly after, was unalble to pass through because the trestles were burned out. At Boyes Springs, the whole town, with the exception of the bath house and a few homes and eating places, went in a very short time. A fierce gale carried burning tree tops two hundred yards setting fire to the roof of the main hotel building. In a few minutes all that remained of the famous hotel was the chimney. The clubhouse, theatre, annex, two garages, the lumber company, and nearly all the stores and residences were destroyed. A charred bell lying on the ground shows where the fire house used to be, and some twisted pieces of metal are all that is left of the garage and the eight cars that were in it. 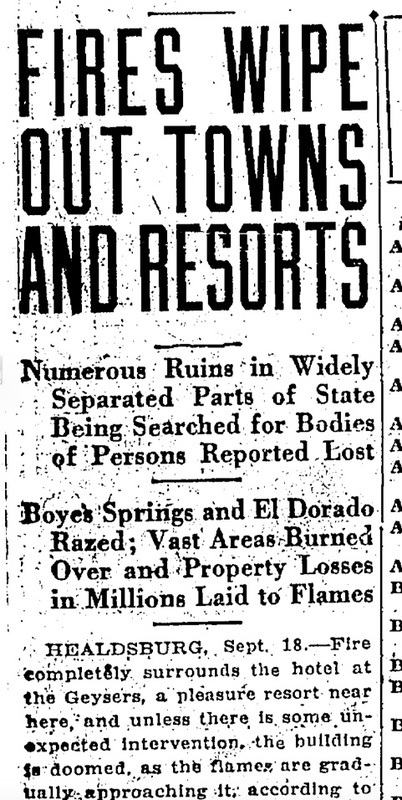 The management of the Boyes Springs Company states that a modern hotel will be built soon, and that in the meantime the bath house will be operated. The new store of Wm. McCarthy, local grocer, at Sonoma Vista, was saved. The total loss in Marin County is estimated at $500,000, in Sonoma county at $2,000,000, and in Berkeley at $9,000,000. In Berkeley sixty blocks were burned. Many beautiful homes, including that of Benjamin Ide Wheeler, president emeritus of the University of California, were destroyed. The campus at the University was saved by the combined efforts of the students who fought steadily and doggedly to preserve it. Many are homeless in Berkeley. The wreckage is being cleared away with dynamite and reconstruction work will commence immediately. Guards of soldiers, stationed in Berkeley to prevent looting, were withdrawn on Wednesday morning. The buildings on the Sleepy Hollow ranch were saved, as well as the buildings on the Bodkin, Pacheco, Lafranchi, Bothin and Dickson ranches. One hundred boys from the San Rafael high school saved the Sleepy Hollow ranch. The traffic officers of the county did excellent work on the roads leadling to the fires in the White’s hill district on Monday night. Chief Wessell and Officers Gallaway, Hartwell, Thwing and Constable Nick Yeager kept the roads clear and also assisted in carrying the Arequipa patients to Fairfax. When the fire was raging on the Bolinas ridge Monday night fifty men from Bolinas headed by men from the United States Life Saving Station went to the ridge and fought fire. Fire Warden Edwin B. Gardner did splendid work in directing the fire fighters. Deputy Fire Warden George Collamore, who was overcome while fighting the fire at Woodacre, is up and around again. At 3 a. m. Wednesday a rootburned tree falling across the concrete 4-foot water main which carries the water supply to all the cities and towns of central Marin, smashed the main, causing a water shortage for several hours. It was repaired by noon Wednesday. Fifteen bridges in Sonoma County were burned causing a loss of $150,000 to the County. In the Cazadero and Geysers section of Sonoma county fierce fires were still raging Wednesday but were being fought by hundreds of fire fighters. Al Dayton and Ernest Ferrari of Duncan’s Mills narrowly escaped death on Monday when the fire swept that region. Finding themselves hemmed in they leaped into Austin creek and submerged themselves while the fire raced across the creek. In September of 1919 a smouldering fire on the hillsides near the residence of E. Chalopin, a local painter, fanned by a heavy wind and suddenly spreading with lightning rapidity destroyed property valued at over $75,000 in South Sausalito, and would have destroyed many homes in that section had it not been for the assistance of the San Francisco Fire Department and soldiers from the Presidio. How the fires started is a mystery which is at present unsolved. The general opinion is that the fires were caused by camp fires left unextinguished and the dropping of burning cigarettes, cigars and inflammable waste from autos in grass by the roadside. It has been suggested that the Berkeley fire started from an electric wire becoming shorted. Whatever the cause, the result should be a lesson not to only careless campers and motorists, but to those who allow grass to grow around their homes, thinking that in case it did catch fire it could easily be extlnguished and would do no damage." Across the San Francisco Bay, the City of Berkeley was burning at the same time as the large fire in Marin, and at the same time as large fires in 16 other counties in California. Over 600 structures were destroyed in Berkeley, and extensive mutual aid came from the Oakland and San Francisco fire departments. ​We have not uncovered any photographs or film of the fire in Marin yet, but the two films below of the Berkeley fire are in the public domain and we are sharing them as part of our history project to help provide context about that terrible time and these massive fires. 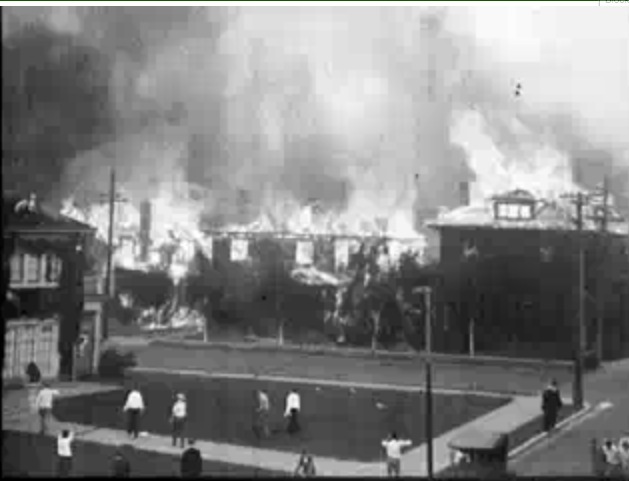 A frame capture from the film below of the Berkeley fire. 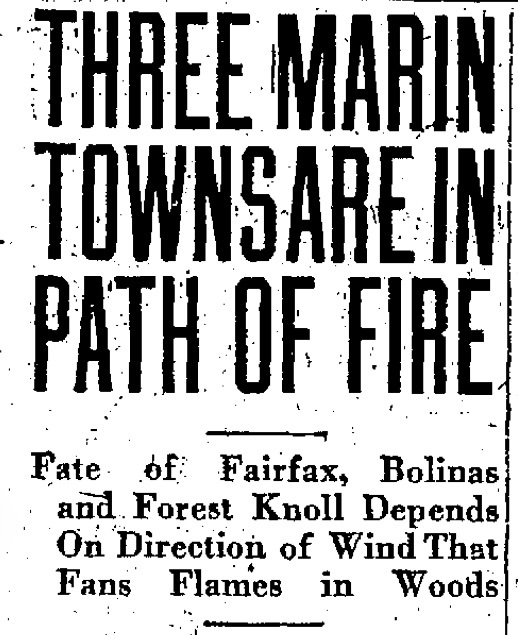 Read a review of the weather during this fire period, written shortly afterwards in 1923. Scroll through pdf.